ADDIS ABABA/NAIROBI/DAKAR, 1st JUNE 2016 – Ensuring equitable access to education is key in addressing the root causes of conflict and instability in Africa, stakeholders said today ahead of the Pan-African Symposium on Education, Resilience and Social Cohesion, at the United Nations Conference Centre in Addis Ababa. 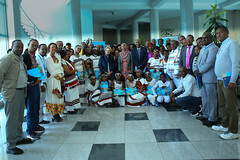 The three-day event shares evidence and best practices from UNICEF’s Peacebuilding, Education and Advocacy Programme (PBEA), and the Inter-Country Quality Node (ICQN) on Peace Education, established by the Association for the Development of Education in Africa (ADEA). In doing so, the Symposium will seek to assess how inclusive, equitable and innovative education policy and programmes can contribute to sustainable peace and development across the continent. Currently, three out of 10 children in Africa are living in conflict-affected settings and exposed to numerous risks. In Sub-Saharan Africa, 36 out of 45 countries are at medium or high risk of experiencing manmade disasters, the highest rate globally. Moreover, at least 327 million children in Sub-Saharan Africa live in fragile contexts and the majority of the estimated 29 million primary school aged children who are out of school are primarily found in fragile settings and are particularly at risk or threatened by conflict. 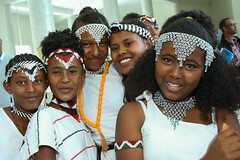 The high-level event in Addis Ababa, which is being attended by Ministers of Education from 16 African countries, including conflict-torn states, will close with concrete recommendations on how to strengthen education sector policy and programmes in Africa to address the risks faced by children and to support sustainable peace and development across Africa. The symposium will also provide evidence to inform both donor and public funding strategies and investment priorities. “Education can play both a protective and preventative role. In doing this, education’s power is transformative and serves as a peace dividend, reducing inequities and grievances between groups and strengthening social cohesion” said the Ethiopian Minister of Education, Ato Shiferaw Shigute. 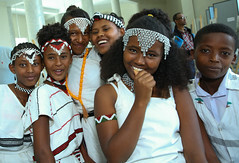 The symposium is co-organized by the Federal Democratic Republic of Ethiopia’s Ministry of Education, UNICEF, the Association for the Development of Education in Africa (ADEA), and the Inter-Country Quality Node (ICQN) on Peace Education. Where can I find access to the concrete recommendations that were put forth in the closing? This symposium sounds very powerful! If possible it would be interesting to have access to some of the documents. Thank you very much! Previous Previous post: Baby WASH – the missing piece of the puzzle?